We blame Disney princesses for making us dream about getting married to our prince charming in a royal palace (cue in teardrop). While it is far from possible for us, some people got to live their (and ours) dream of getting married in a palace. Here are some of our favourite real weddings that took place in palaces. 1.This cross cultural wedding took place in Samode Palace in Jaipur. It was a blend of Sikh and Jewish rituals. The happiness is reflected on their faces! 2. Rohan and Kriti got married in Udaipur’s Chunda palace. The pictures are splendid, you can check for yourself! 3. A classic case of Punjabi meets Bengali, Deepika and Rudro got married in Jaipur’s Chomu Palace. Oh-so-pretttyyy! 4. Samode Palace seems to be a favourite among cross cultural couples. 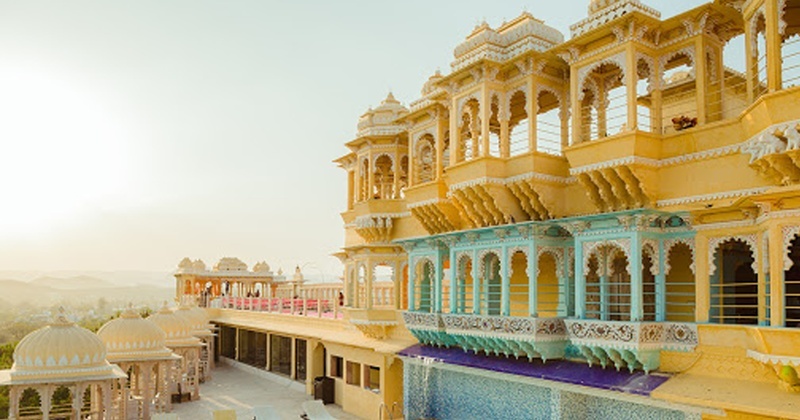 Swathi and Stefan tied the knot in this beautiful Jaipur palace setting goals for everyone! 5. Moumita and Sriraj had a dreamy wedding at Neemrana Fort Palace in Alwar. Everything about this wedding screams LOVE in bold! 6. Cross cultural weddings are one of our favourites and so is Laurie and Pankaj’s wedding at the Chomu Palace. 7. Nanki and Ishaan managed to arrange their uber cool yet traditional wedding at Shiv Vilas Palace all by themselves! 8. Ankit and Payal’s wedding at the City Palace, Udaipur was splendid and over the top. Check it out! 9. Rooftop wedding? Palace wedding? Yes, please! This elegant wedding took place in Chunda Palace. 10. This bride got a chance to get married at the Laxmi Vilas Palace in Baroda cause she worked there! So..is any palace looking for interns? Or sweepers? Cause we are ready to apply! Maybe even we’ll get a chance to have a palace wedding!